Hello everyone. Sorry for being a little MIA lately. My husband and I took a much needed vacation. Truth is, hubby surprised me with a trip to Charleston and Savannah to celebrate my birthday. Both Charleston and Savannah have been on my wish list for a long time and having the opportunity to visit and explore both for my 50th birthday, was a dream come true. I loved each destination equally and I will share a few photos of my trip on a future post. Don't you just love the anticipation of spring? Promises of beauty and new beginnings. Reminders of hope and renewal. And when I think of spring, I can't help but think of the shade green in all of it's glory. Today's table pays honor to this beautiful spring color.. Appropriately, green is the Pantone color of 2017. 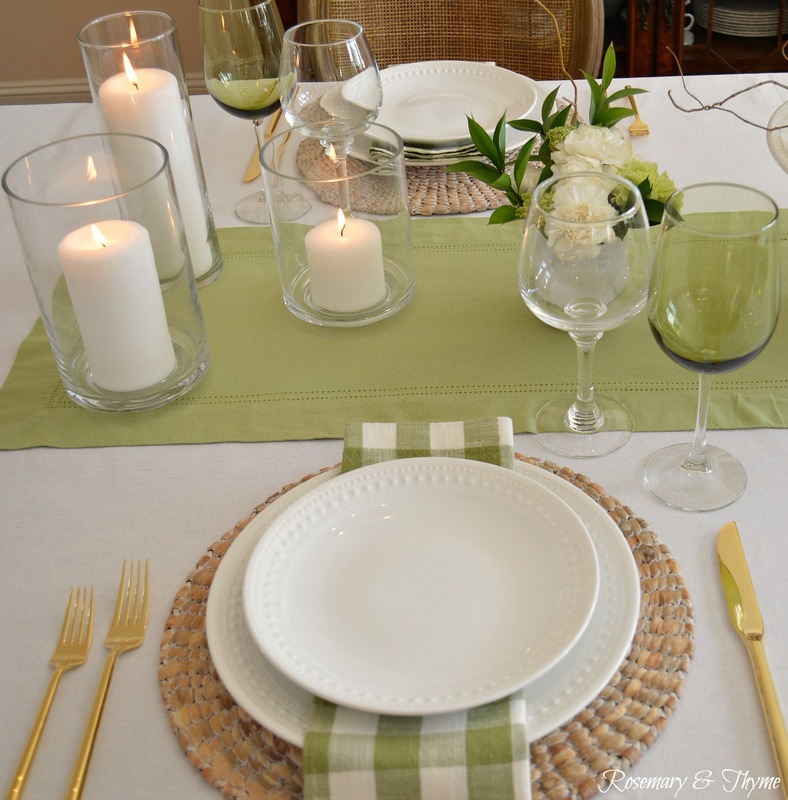 Today's table is set for a casual dinner with family. Natural woven place mats (Home Goods) set the scene for a relaxed and informal dinner. 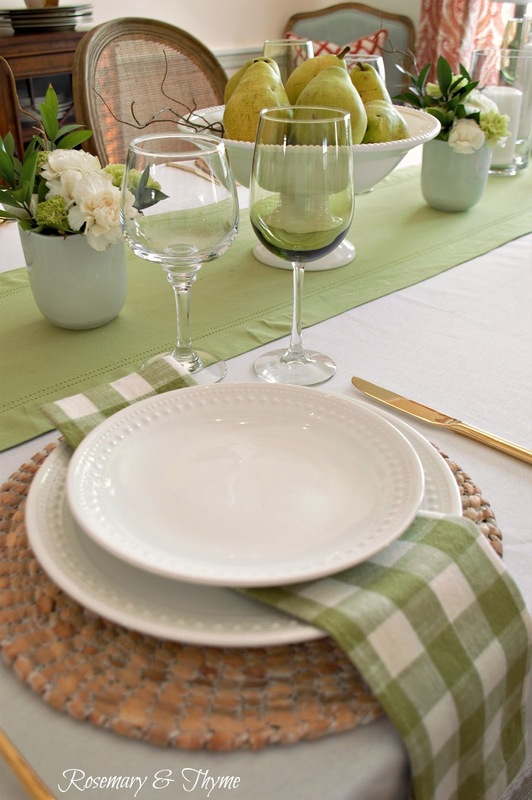 White dishes (Home Goods) are paired with green and white gingham napkins (Pottery Barn). 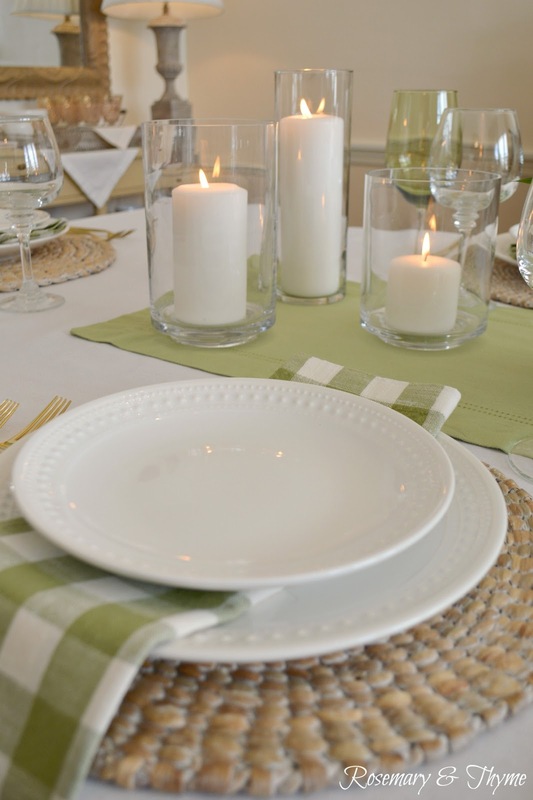 Green wine glasses (Dollar Store) continue the color scheme for this table as well as a table runner (Home Goods) in the same shade. 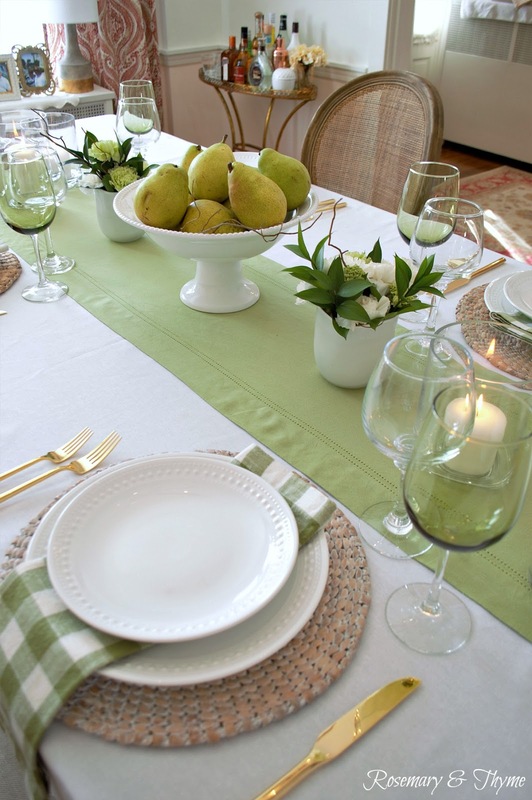 A casual white pedestal bowl filled with green pears acts as my centerpiece. 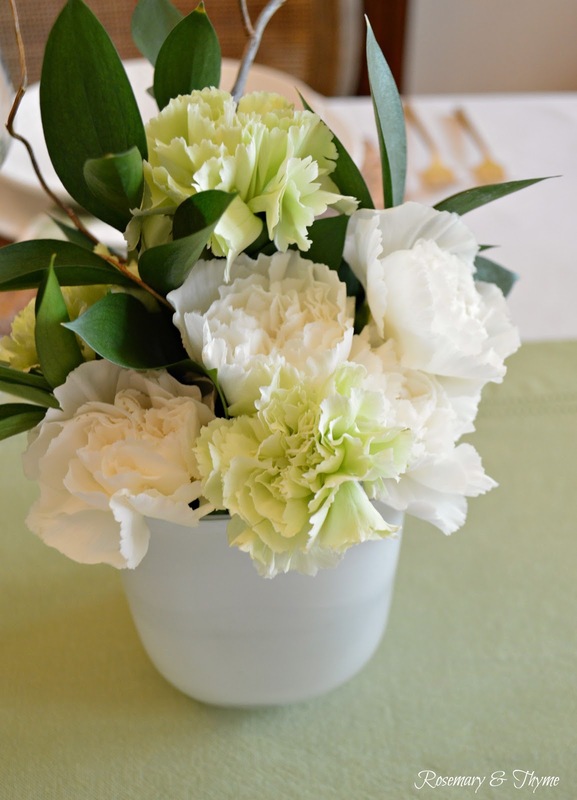 Small vases hold inexpensive carnations but add visual interest to the table. Isn't this floral arrangement sweet? Thank you for being here today. I hope you are inspired to create your own perfectly pear-ed details to start off your week. Like a breath of fresh, Spring air! This is a beautiful table, Janet. I look forward to seeing your photos from Savannah and Charleston. Must have been a perfect time to visit those towns. Thank you for your kind comments on my blog... Charleston and Savannah were perfect. And the weather was ideal for walking and touring. I should have my photos my next week. Love your spring table~ you set such pretty tables! I am sure you had an amazing time in Savannah and Charleston ~ I love both places. Thank you for your kind words on my tables... Charleston and Savannah were perfect. And the weather was ideal for walking and touring. I should have my photos my next week. Thank you so much. You are so sweet.... Charleston and Savannah were perfect. And the weather was ideal for walking and touring. I should have my photos my next week. I appreciate your lovely comment on my tablescape also. I hope you went back to Dollar Tree and picked up those wine glasses. You can't beat the price and they are gorgeous. Is is my pleasure to join your party each week.. I love that shade of green! There's one more blue table on my roster and then it's all about this color. Those buffalo check napkins are so pretty and I'll be on the lookout for those also. Thank you for sharing with us this week at Celebrate Your Story, have a great weekend. 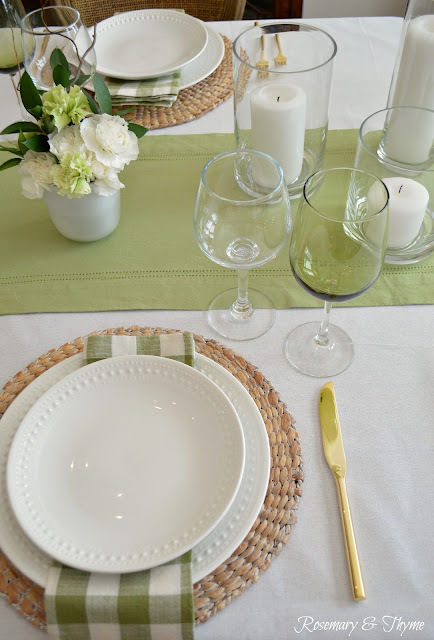 Thank you for your kind comment on my tablescape. I do love my green in spring and summer although we are in the middle of a winter storm. 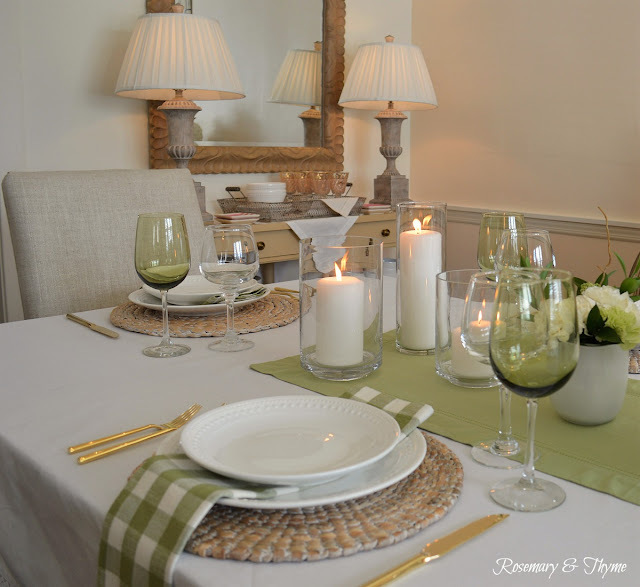 I hope we can now move on to spring like temperatures and decor. 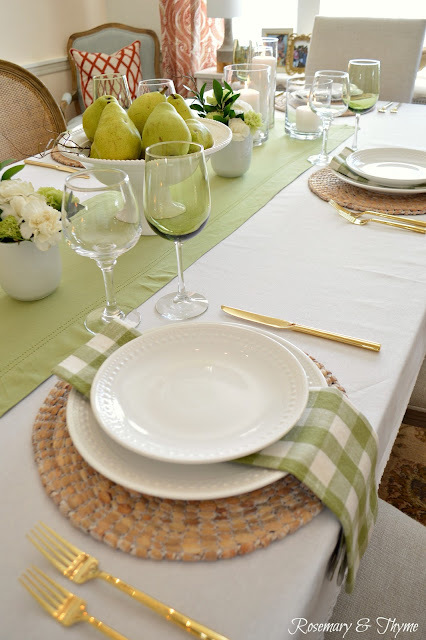 I love the simple green and white table and it is just perfect for St. Patrick's Day, isn't it? I love your gold flatware, I just got some myself and this looks similar. Is yours from West Elm? Thanks for sharing at Celebrate Your Story. Thank you for your kind comment on my tablescape. Yes, I do agree. Perfect for St. Patrick's Day. 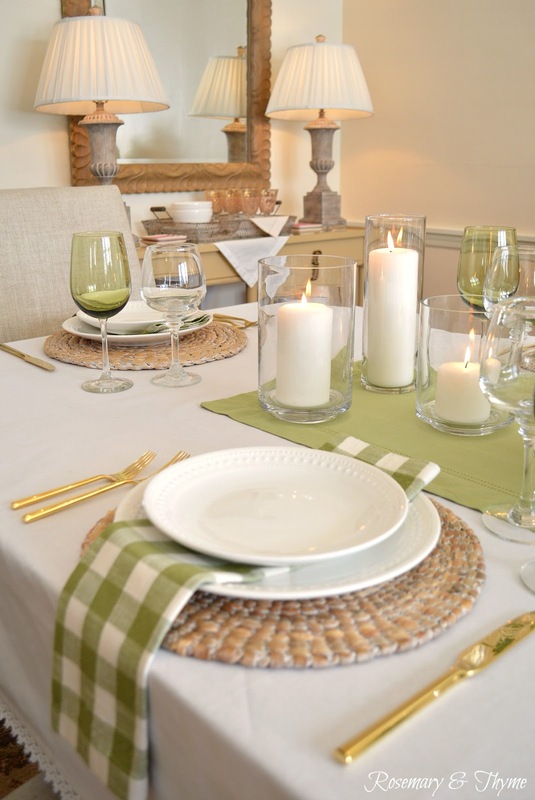 Gold flatware is having a moment. I do love using it on my tables. 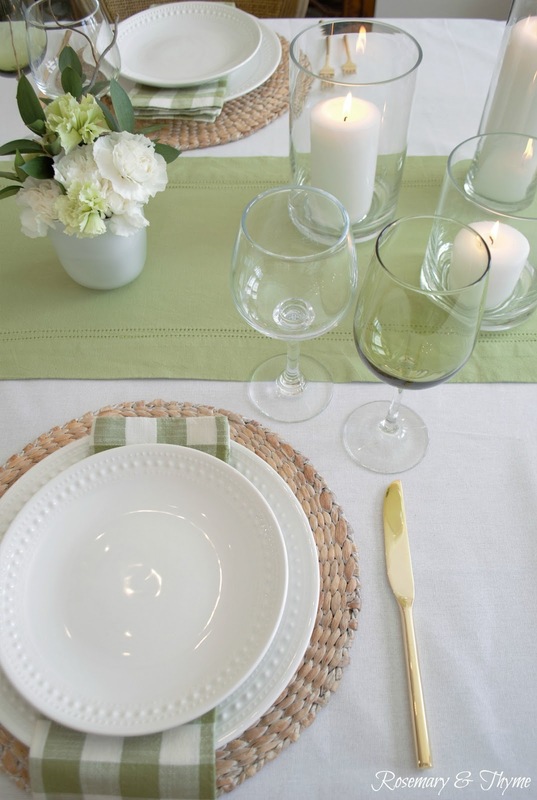 It really adds a touch of sparkle and elegance to the table. Almost like jewelry. I bought mine at Target can you believe!!! Thanks so much Kathryn. I am extremely happy and grateful for the feature. Wishing you a beautiful spring season.